The harsh winters of Delhi in my childhood remind me of this one memory. My parents would make me fill the pockets of my school blazer with almonds, cashews and raisins. I would pair one cashew or almond with a raisin to sweeten the bite. My parents and grand-parents would feed us endless amounts of different nuts during the season and tell us that eating nuts and dried fruits would keep us warm during winters. And that was my inspiration for making a nut butter. I have, in a way, continued that tradition of making sweet treats like halwas at the drop of a hat and nibbling on dried fruits and nuts a habit in winters. So when I saw an article on the Kitchn on how to make nut butters, I knew I had to give it a try. So I made a small batch of all nut butter without chocolate first and it was a success. I know it was a success because I finished it really quickly and realised that I had to make another batch really soon. My parents on their recent travels across Europe had gone over-board buying high quality chocolates a part of that made it’s way to Dubai with me. 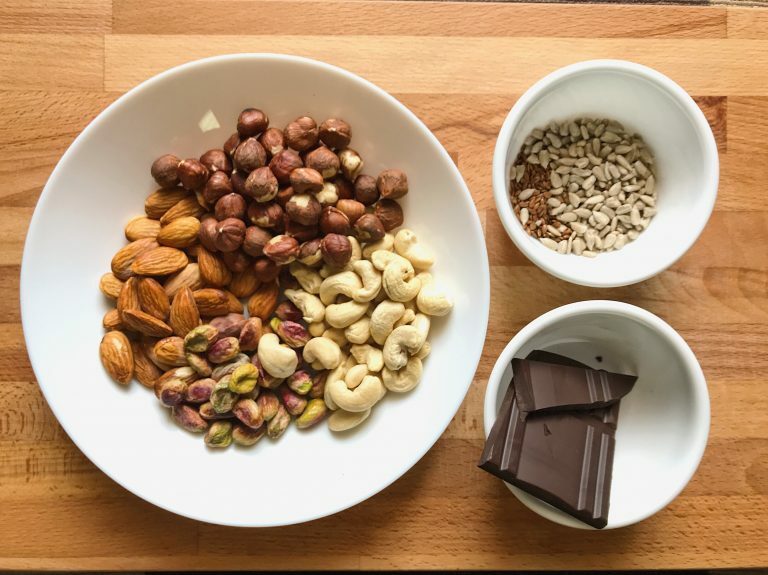 These chocolate bars were hibernating in my fridge for months until I gave their life a purpose and decided to use them in my next batch of nut butter. 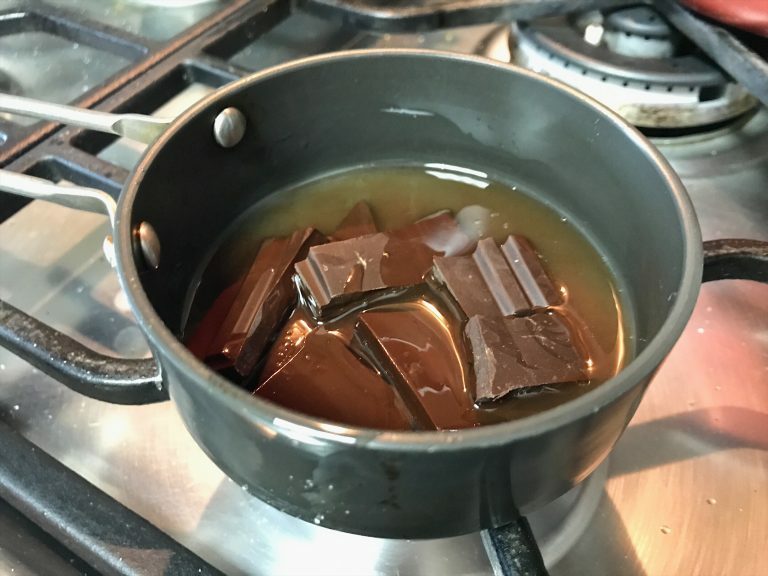 I decided to use some coconut oil with the chocolate to melt it into a smooth liquid. A bit of liquid oil does help the nuts going in the processor and release their natural oils. A good sturdy food processor is a must! I cannot emphasise this enough. 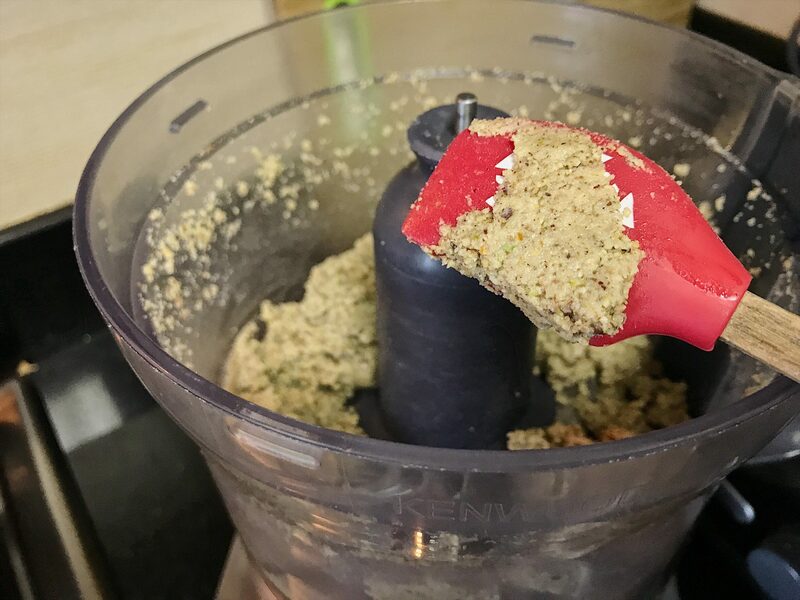 Using a good heavy duty food processor is the most important tool for making nut butters at home. 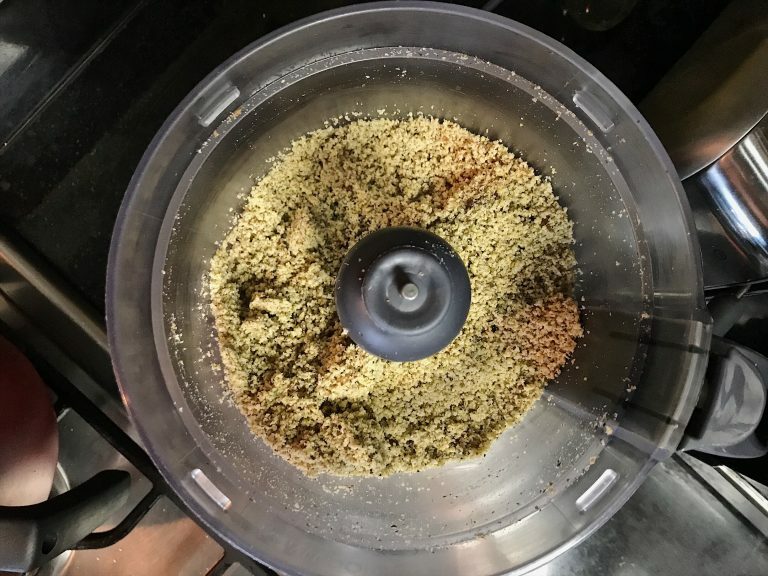 My friendship with this wonderful tool goes back to the 1990s when my busy, working parents decided to invest in an Inalsa food processor to help them in their day to day cooking needs. We’ve been a family that mostly eats home cooked meals and a food processor made life real simple for us. As a kid, I would see my mom knead dough for chapatis in less than 3 minutes. This machine would grate, chop, whip, juice and knead. It won’t be surprising if I would say that it was our humble Inalsa that made cooking seem really easy to me as a young child. My parents finally retired their 21 year old Inalsa in 2015 and switched to a newer version. As for me, I use a Kenwood Multipro Compact that I swear by. If only I had known I could be making nut butters in the 1990s. But getting a sturdy food processor is just one part. You should know when to stop and give your food processor a break to let the machine cool down. My processor has 750 Wattage and I let it cool down after running for 2-3 minutes. 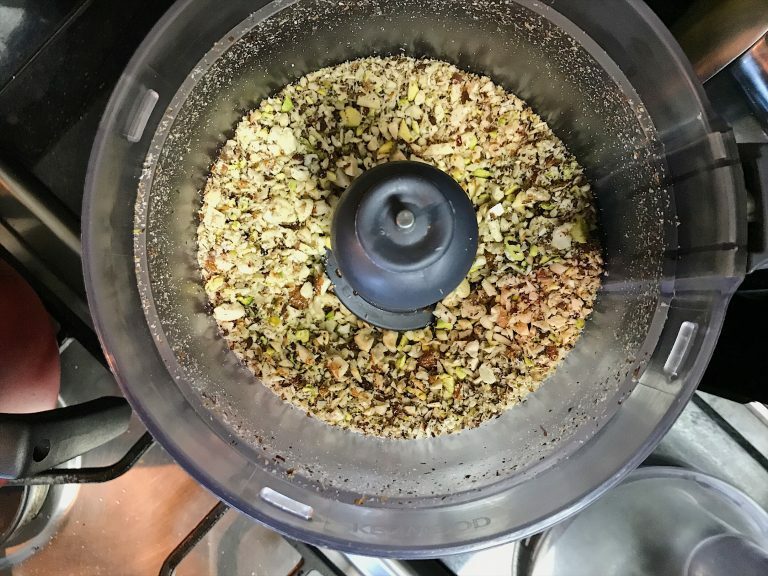 Processing nuts to make nut butter takes a lot of power and trusting your food processor and giving it time is the key to this recipe. 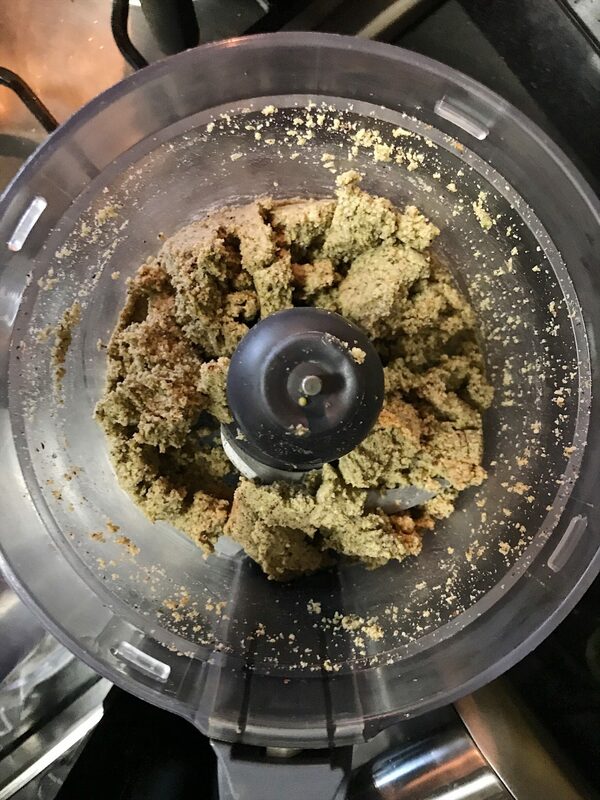 At first when you start processing your nut butter, you would see that the contents of your processor jar look nothing like a butter. It will be long before it actually starts coming together, literally. The nuts will first break down in chunks, then into finer chunks and subsequently into a coarse mix of nuts. It will remain a coarse mix for a long time and that is the time you need patience. 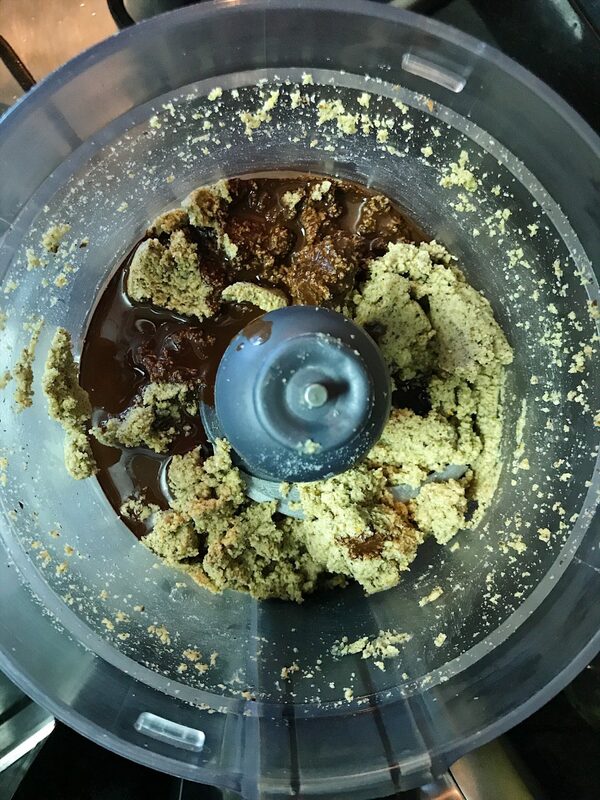 While making any nut butter, one needs to process for short durations of maybe a minute, scrape the sides and process some more. It takes a long time for the nuts to actually release their oils so one needs to keep going till you see the desired texture. Adding small amounts of coconut oil does help coagulate the mix and move it better in the processor jar. The ideal texture depends on your preference. Like store bought peanut butter, you could let it be chunky or smooth. If you keep processing, you will end up with a smoother nut butter but don’t expect it to be like a store bought version. Homemade is rustic! Tools required – A sturdy food processor with a blade attachments, silicon spatula, air tight container for storing. Gather all the ingredients and group the nuts and sunflower/pumpkin/flax seeds. The idea is to roast the nuts and seeds separately. If you are using the Chia seeds, do not mix them with other seeds now. Place a heavy bottomed vessel on medium low heat and tip in the seeds. Move the seeds around the vessel so that they are evenly toasted. Toast the seeds for about a minute and a half and then take them out in a plate. Next tip in the mixed nuts in the same vessel and toast them for about 4-5 minutes on medium low heat. The nuts need to toast very lightly so that they release their oils soon on processing. 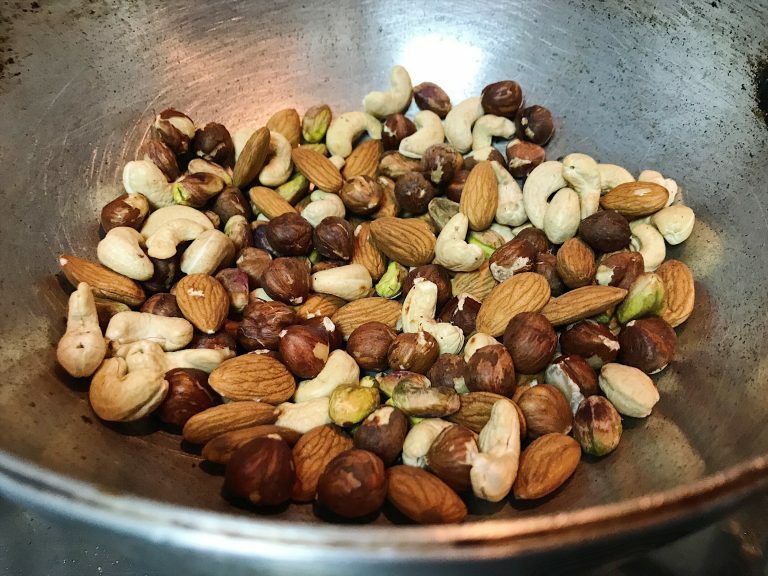 Take out the nuts in a wide plate so that they stop roasting more in the warm vessel. Place the nuts and seeds in the food processor bowl with the blade attachment. Process in short pulses till the nuts break into smaller chunks. Scrape the sides and process some more. The nuts will becomes into a coarse powder eventually. Scrape the sides of the jar and process more. After repeating the above step 5 or 6 times, add a small amount (around 2 teaspoons) of coconut oil and sea salt according to taste. Process to incorporate and you will see the mixed nuts break down further and form a dough like mass. Keep processing in short bursts. You will need to give your food processor some rest in between pulses so that the machine does not overheat. In a small pan, heat a small amount of coconut oil with unsweetened chocolate chips or chunks. Melt the two together till they incorporate and form a runny liquid. 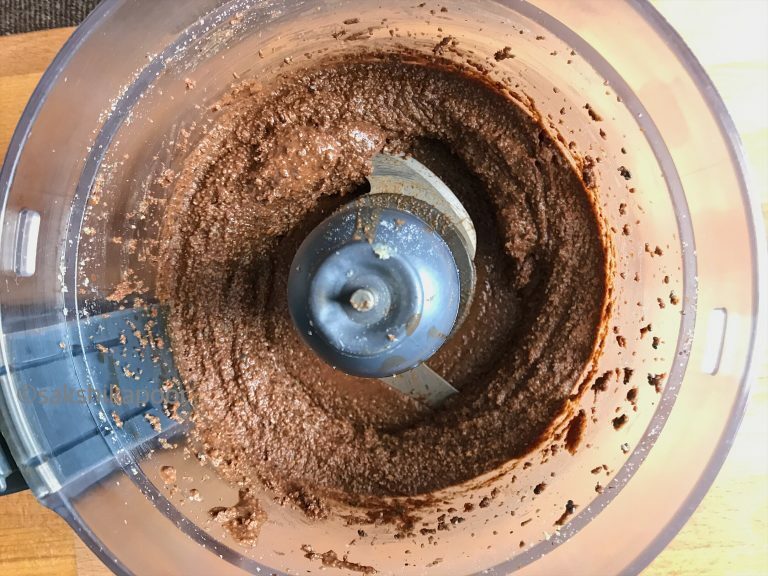 Add this melted chocolate and coconut oil mixture in your nut butter and pulse for some more time. You will see that the liquid helps give the nut mix the desired texture of a chunky nut butter. Next, add honey or maple syrup according to taste at this time. If you are using dark chocolate like me, then you may need to add a little more honey or maple syrup. Throw in some cinnamon powder at this stage. 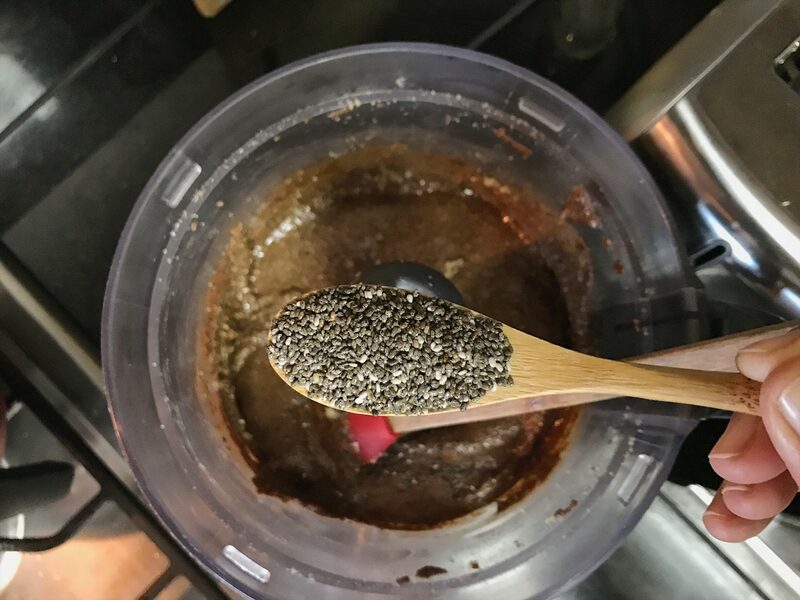 If you are using chia seeds, now is the time to add them to the nut butter and process more. Chia seeds will also thicken the butter eventually and make your nut butter chunkier. Adjust the amount of sea salt according to your taste and then your Nut butter is ready. Scrape out the butter and store in a clean air tight container. 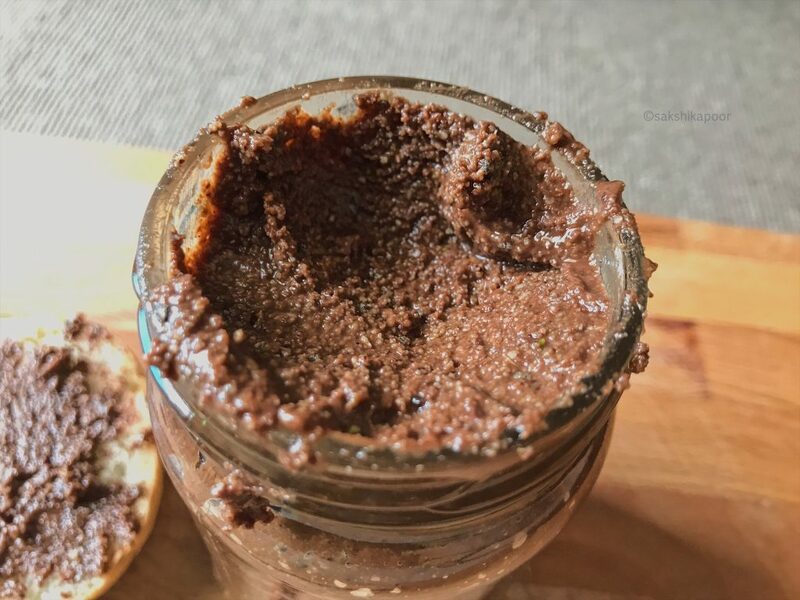 Salted Chocolate Nut butter is ready to be spread on toasts, crackers and is also a great addition to smoothies and smoothie bowls. A delicious salted chocolate spread made with assorted nuts. Great for spreading on toasts and crackers or in smoothies and smoothie bowls. Next tip in the mixed nuts in the same vessel and toast them for about 4-5 minutes on medium low heat. The nuts need to toast very lightly so that they release their oils soon on processing.